수도권은 우리나라의 심장부에 해당하는 서울을 중심으로 지난 반세기 동안 국가의 경제성장과 궤를 같이 한 지역이다. 따라서 수도권은 서울과 일체적으로 작동하는 하나의 대도시권으로 인식할 필요가 있으며, 서울을 제대로 이해하기 위해서는 서울시의 행정구역을 넘어서서 실질적 영향이 미치는 지역, 즉 서울대도시권이라는 광역차원에서 접근할 필요가 있다. 서울대도시권의 공간적 범위는 학자들마다 다르게 설정되기도 하나, 법률상 수도권의 정의는 서울시와 인천시, 경기도를 포괄하는 지역으로 한정된다. 본 책자에서는 법률상의 수도권을 기준으로 그 특색과 변화동향을 살펴보았다. 수도권은 우리나라 중부의 서쪽에 위치하며, 서쪽에 황해의 경기만, 북서쪽에 황해도, 동쪽에 강원도, 남쪽에 충청도와 접하고 있다. 황해도와의 경계선에는 마식령산맥, 충청북도와의 경계선에는 차령산맥이 달리고 있다. 수도권의 서부는 대체적으로 평탄한 충적평야인데 반하여 동북부에는 고도 1,000m 이상의 높은 산들도 솟아있다. 가장 중요한 수계는 강원도에서 발원하는 한강수계이며, 수도권을 동서로 가로지르는 한강은 자동차 및 철도 교통이 발달하기 이전까지 중요한 내륙수로의 역할을 수행하였다. 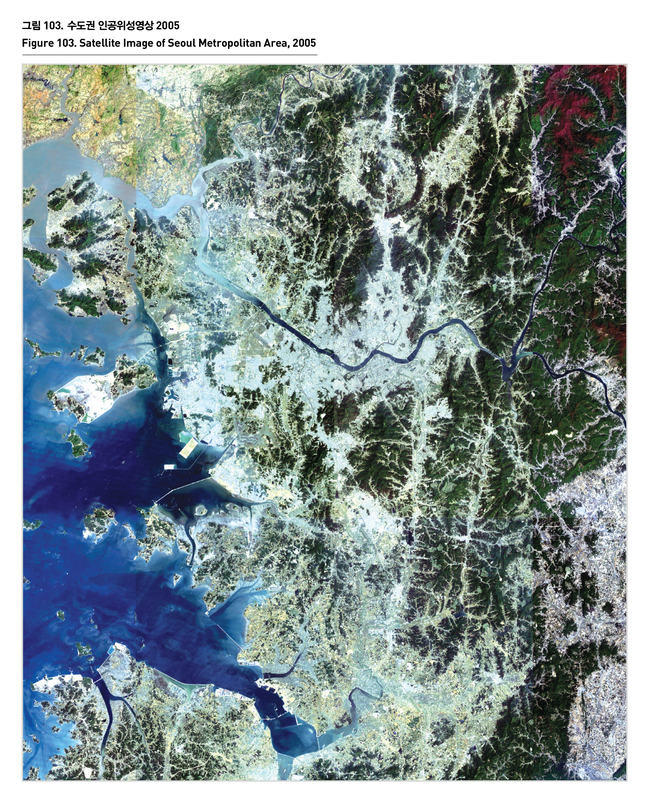 The growth of the metropolitan area, centering around Seoul, has been in line with the nation’s economic growth over the last 50 years. The metropolitan area needs to be recognized as a large city that acts like Seoul. There are differences in the scope of Seoul metropolitan area defined by scholars, but the legal definition of a metropolitan area is limited to Seoul, Incheon city and Gyeonggido. This book looked at the characteristics and changing trend of a legal metropolitan city. The metropolitan area is located in the west of the middle of Korea, and borders on Gyeonggi Bay in the west, Hwanghae-do in the northwest, Gangwon-do in the east, and Chungcheong-do in the south. There are Masingnyong mountains on its boundary with Hwanghae-do, and Charyong mountains on its boundary with Chungcheongbuk-do. While, most western regions of the metropolitan area are alluvial plains, northeastern regions have high mountains with the altitude of above 1000m. 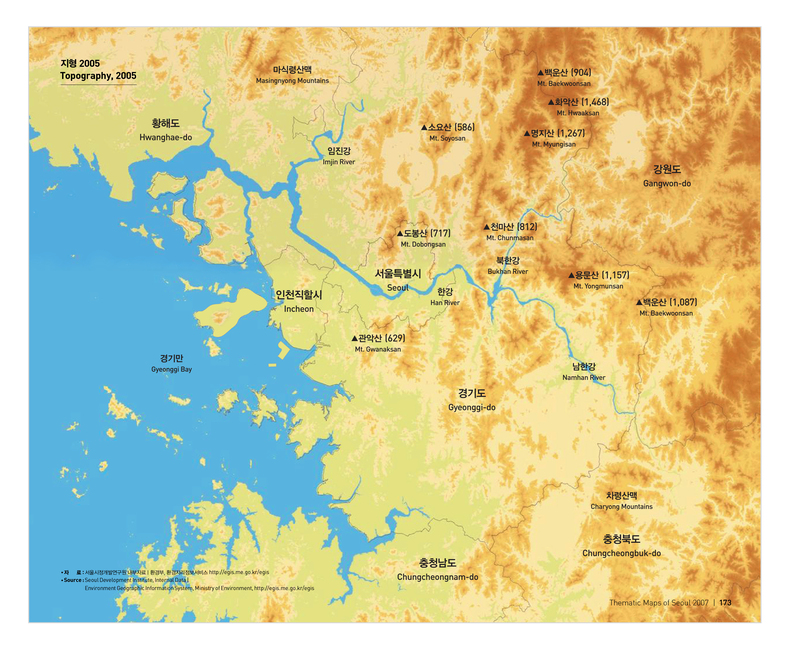 Han river flowing from Gangwon-do is the most important water system, and the river running from the east to the west served as the inland watercourse until automobile and train transportation was developed.